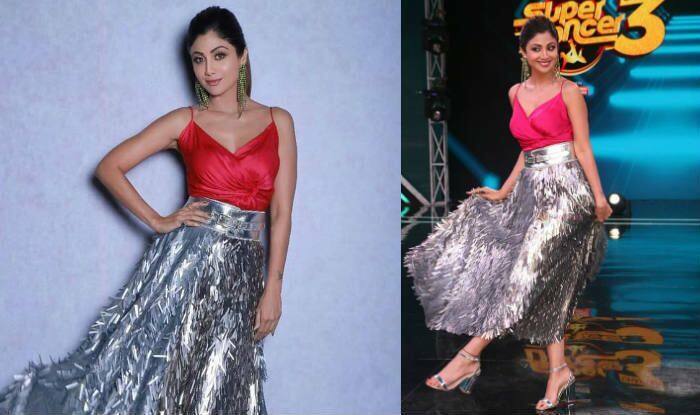 Shilpa Shetty wears a red-pink top with a silver skirt on her show to tape a Christmas special episode. Shilpa Shetty is busy with the shooting of a dance reality show, that she judges. The actress, who is always dressed up to the T, recently taped a Christmas special episode for the show. For the same, she wore a red-pink top and a silver skirt, giving major festive vibes. The actress is known as one of the most fashionable divas of the film industry. And this time too, Shilpa was successful in maintaining that tag. While the actress is often seen making a style statement, this Christmas-look has more to it than fashion. It was a look that seemed very relaxed and comfortable, without losing out on style. Also, considering Shilpa has been making a lot of appearances in a saree lately, the skirt look came out as a breath of fresh air. Meanwhile, for her reality show Super Dancer 3, she is being accompanied by filmmaker Anurag Basu and choreographer Geeta Kapur as co-judges. Watch out this space for more of her stylish looks!